Do you think putting "I Voted" stickers on Susan B. Anthony's grave is a good way to honor her legacy? Why or why not? 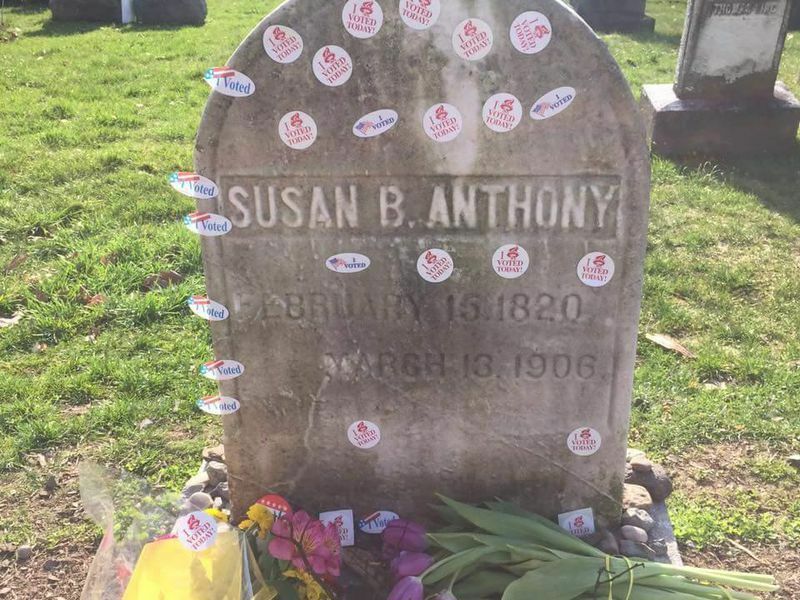 According to the article, women put "I Voted stickers on Susan B. Anthony's grave to honor her legacy. Think of another famous woman from the past. How do you think people should honor her legacy? Susan B. Anthony spent more than 60 years fighting for equality for women. What cause would you spend your entire life fighting for? Why is this cause so important to you? What do you think the United States would be like today if people like Susan B. Anthony had not fought for equal rights for women more than 100 years ago? If Susan B. Anthony were alive today, what rights do you think she would be fighting for now? Introduce students to early pioneers in the fight for women’s rights, including Susan B. Anthony, with this collection from the National Portrait Gallery. In celebration of Women’s History Month 2018, the Smithsonian Transcription Center invites you to transcribe collections highlighting the historical contributions of women in science, technology and art to make these collections more accessible. Check out his site to learn how you can help spread the word. This Smithsonian History Explorer inquiry, targeted to middle school students, examines the emergence of the women’s suffrage movement in the 19th century as an effort to expand women’s political and economic rights. It extends that investigation into the present. A cartoonist diagrammed the parade—5,000 suffragists strong—that defiantly marched in Washington more than 100 years ago. Read this Smithsonian article to learn more about this historic event. Reading "Mama Went to Jail for the Vote"
The strategies in this lesson will help teachers and lower elementary students actively read "Mama Went to Jail for the Vote" together. This historical fiction is about a girl whose mother joins the suffragists to win the vote for women. This Smithsonian Learning Lab collection explores the key components and changes that have occurred during the struggle for women’s rights. It is meant to spark discussion about the movement and its long-term impact on history and the issues that still face women in their fight for gender equality today. Enjoy this collection of songs highlighting women’s liberation that was created by Smithsonian Folkways in recognition of the 2017 Women’s March on Washington. This lesson plan examines an 1898 Standard Voting Machine and the democratization of the voting process in the U .S. It includes an introduction to doing history with objects, three lesson plans on the history of voting, and annotated links related to the extension of voting rights to women and African Americans.